Gold jewellery speaks of power and wealth. It is highly gendered, and is embedded with symbolic and cultural meanings. It is located at the centre of the capitalist economy and holds a powerful place in our imagination. The mix of cash and sentiment within gold jewellery has given it a special place in gift giving practices. Throughout history, we have exchanged jewellery to symbolise bonds of friendship and love, to mark rites of passage – birth, coming-of-age, marriage and even death – and pass them through successive owners from generation to generation. As pieces of gold jewellery pass through owners, they build histories of their own and come to contain traces of people and places. They become loaded with layers of meanings, memories and myths. However, the financial value of the precious metal makes these objects – and the meanings embedded within them – vulnerable to obliteration, melted down for use as currency or to be reformed in line with changing fashions. 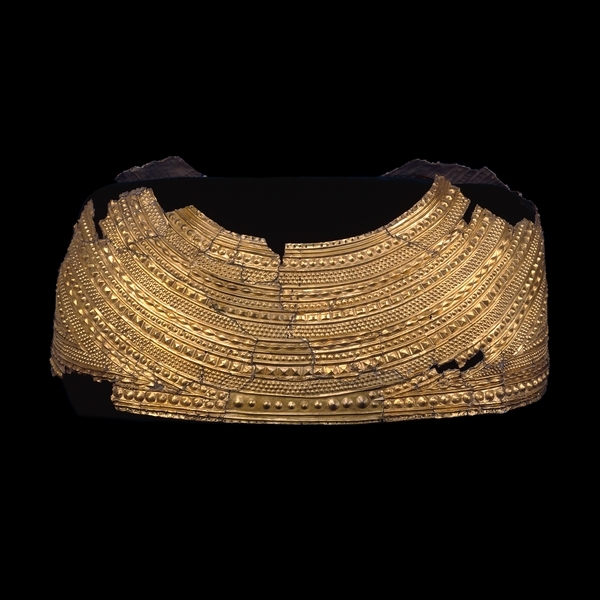 For example, the Mold gold cape in the British Museum, which dates to 1900-1600 B C and is widely considered to be one of the finest examples of prehistoric sheet gold working in the world, was broken up and sold off by the workmen who uncovered the treasure around the shoulders of a skeleton in rural Wales in 1833. Jane draws attention to the complex issues of gender and power at play, and highlights how garments and jewels were purchased – and worn – together. Jewellery, as a form of dress worn on the body, can be understood as material evidence of the ways in which changing gender and social identities are created and articulated. As objects, jewellery made from gold can tell us about how the historically revered but often secretive craft of the jeweller and goldsmith changed to fit with shifting fashions and consumer desires. Jewellery is often missing from the histories of dress and fashion. In museums, jewellery artefacts are presented as disembodied objects rather than on dressed mannequins because of issues around conservation and display. Yet, as highlighted in Costume (Vol. 40, 2005), 'We wear dress and jewellery together – why separate them intellectually?'. This idea was put forward in relation to The Costume Society’s Ruby Symposium in 2005. A decade later, ‘Power of Gold’ is themed around the intersections between dress and this most precious of metals. I am delighted to be presenting at the Power of Gold symposium on the transformation of gold from raw materials to jewellery with a focus on a gold rush in the Highlands of Scotland in 1869. Tracing how jewellers transformed these native materials into crafted objects that were worn and treasured by their owners has led me along remote burns and into magnificent castles. My doctoral research explores how changing fashions reshaped the jewellery craft in the nineteenth century, with a focus on Scotland. This research is part of a wider project at the University of Edinburgh, ‘Artisans and the craft economy in Scotlnd, c. 1780-1914’, funded by the Leverhulme Trust. Join me, Sarah Laurenson (@ReformLane) and Dr Benjamin Wild(@wilddoughnut) between 1300 and 1400 (GMT) for the Costume Society’s next Twitter discussion on Friday (3 July), where we will be discussing gold. Simply use #CSFashionHour to join the chat. Helen Clifford (ed)., Gold: Power and Allure (London: The Goldsmiths’ Company, 2012). Susan North, ‘The fusion of fabric and gem: The Costume Society Symposium 2005’, Costume, 40 (2006), 1-8. Marcia Pointon, Brilliant Effects: A Cultural History of Gem Stones and Jewellery (New Haven and London: Yale University Press, 2009).